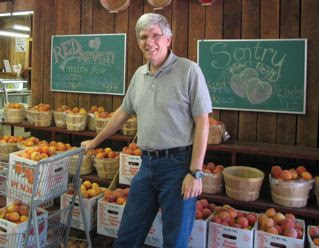 Randal's favorite fruit is peaches and we have loved a variety called Red Haven from Saunders Brothers Orchard in Piney River, VA.
For weeks he's been wanting to head out for a bushel but my memory said mid-July. When we arrived it was the day after that they had posted for Red Haven peaches to be harvested. Just in time .... I love it when intuition (Holy Spirit) works better than anything. Saunders has a lot of antique tools and historical photographs in their sale shed and there was gospel music playing. I lingered around awhile letting my mind drift to simpler times. Well, maybe they weren't simpler as in easy ways of getting work done ... but simpler in that the expectations weren't so high and people took time for people and community. I just wanted to soak some of it up. My grandfather was born near the Blue Ridge Mountains and I know it's in my blood because I am awestruck every time I get to view them. 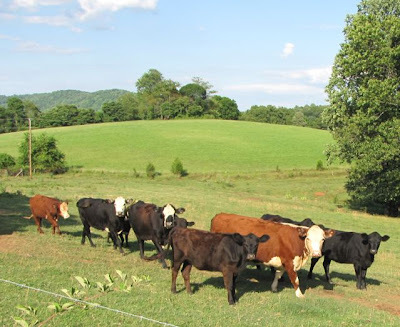 The views from the orchard and the feel of the rural stillness was overwhelming. As Randal loaded the car with the peaches, I wandered down the driveway and off to the hill for a better view of the mountains. I hadn't gone far before I was watering the gravel with my tears. Have you ever been to a "place" that you know is calling your life to it? There's such a strong knowing inside when I'm in that area. It's like the courtyard of the Lord --- the entrance to the Temple. Hundreds of years of life and rural living seemed to pass through my mind like the soft breeze that made this July day so cool. "... that He would grant you, according to the riches of His glory, to be strengthened with power through His Spirit in the inner man; so that Christ may dwell in your hearts through faith; and that you, being rooted and grounded in love, may be able to comprehend with all the saints what is the breadth and length and height and depth, and to know the love of Christ which surpasses knowledge, that you may be filled up to all the fullness of God." I had read about a rail trail in Lynchburg, VA, that went across a footbridge to Percival Island which sat in the middle of the James River, preserved for wildlife. 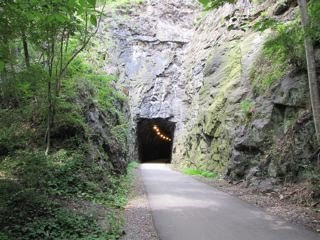 In the other direction the trail entered a 502 foot railroad tunnel through the mountain that was 10 feet wide. The enticing article made us add this to our day trip since it was only 15 minutes further along the highway. It was a great day ... but then any time I'm in the woods, it's a great day. Before they formed in 1986 there were fewer than 200 known rail-trails. Today, there are 100,000 members and supporters and more than 1,500 preserved pathways that form the backbone of a growing trail system. Rails-to-Trails Conservancy remains dedicated to the creation of a nationwide network of trails and is committed to enhancing the health of America's environment, transportation, economy, neighborhoods and people, ensuring a better future made possible by trails and the connections they inspire. TrailLink.com is a free service from Rails-to-Trails Conservancy that allows you to search for a trail near you. They also provide maps and photos. Check out TrailLink.com.